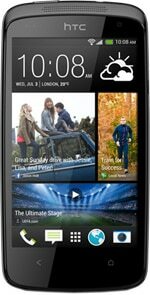 The HTC Desire 500 is a mid-range Android smartphone, available both with and without NFC. The device features a 1.2GHz quad-core processor, HTC’s BlinkFeed home screen, an 8 megapixel rear camera and a 1.6 megapixel front camera, as well as a 4.3-inch display. The Desire 500 became available in Taiwan in summer 2013 and will launch in Europe in late August.